While his regular season performance throughout his career put forth a strong case for the Hall of Fame, it was Reggie Jackson's amazing success during the playoffs that made him a true baseball legend. Winning an impressive five World Series rings, he became one of the most popular players of the 1970s and his cards were some of the most in-demand options of the era. In this detailed guide, the key Reggie Jackson baseball cards are brought together and the list encompasses all periods of his career. Shop for Professionally Graded Reggie Jackson Cards on eBay. 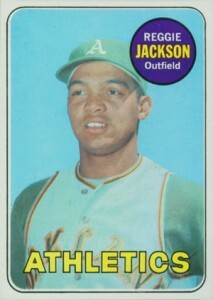 Jackson's 21-season career was spent with four teams and his most notable stints took place with the Oakland A's and New York Yankees. A 14-time selection to the All-Star team, he would end his career with 563 home runs. Three of those home runs hit during the 1977 World Series would forever earn him the nickname of "Mr. October" from his teammate Thurman Munson. 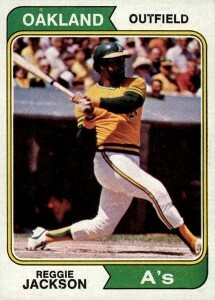 Jackson was named American League MVP in 1973 and was twice the World Series MVP, becoming the first person to win that award with different teams. At the peak of his popularity while with the Yankees, Jackson famously had his own candy band called the Reggie! Bar. Put out by Wayne Candies, Jackson collectors can still find original wrappers of the candy for sale on auction sites. The 1993 Upper Deck set included several cards of Reggie featuring another Wayne Candies product, the Clark Bar, to honor his election to the Hall of Fame. Outside of this collection of Reggie's best cards, there are a few more beautiful pieces of cardboard that make a great addition to a collection. An appealing non-Topps card from the earlier part of Jackson's career can be found in 1973 Kellogg's Pro Super Stars. 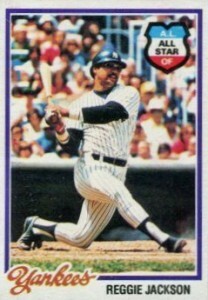 1981 Fleer features a Reggie card in his Yankee pinstripes with another one of his nicknames, "Mr. Baseball," across the bottom of the card. 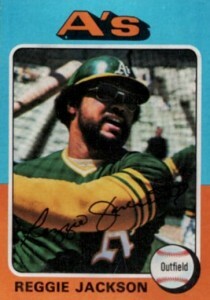 Jackson's first card as a California Angel is in the 1982 Topps Traded set and, after signing with the Oakland A's for his last season in the majors, he was included in the 1987 Topps Traded set as well. A few more budget-friendly Jackson appearances from the 1980s include his box bottom card in 1986 Topps that could be cut out. 1988 Score included a five-card retrospective of his career beginning at card #500. Closing things out, collectors can find the last Reggie Jackson card as a player in 1988 Fleer. 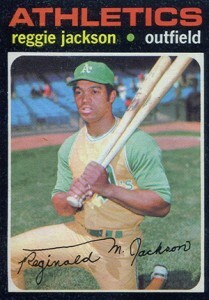 Reggie Jackson's career in cardboard extends from his key rookie card to the days of overproduction in the mid-1980s. While putting together this top list, the value of each entry was considered as well as other points, such as design and the card's overall hobby importance. Like the rest of the 1975 Topps set, this Jackson card is found in the regular and mini size. Along with those two cards, completists can also add an action card for Game 1 of the 1974 World Series and another honoring Jackson's 1973 MVP award. As a testament to Jackson's popularity, he is featured on six different cards from the 1974 Topps set. That breaks down to one base card, two leaders cards, one All-Star card, and two World Series cards as the Oakland A's won their third consecutive World Series crown in 1974. Beyond the two notable rookie cards from the set, the Reggie Jackson base card is probably the most popular card from the 1978 Topps set. The card features a huge Jackson swing and was produced at the peak of his hitting skills. The red, white, and blue All-Star medallion is also nice addition to the card's design. 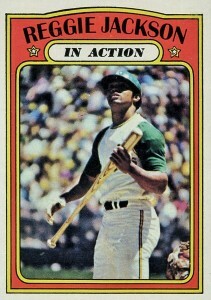 It is easy to imagine Reggie is watching a towering foul ball fly out of play in his 1972 Topps In Action card. The reverse side of the In Action cards feature a newspaper cover page of an important event from 1971. In the case of Jackson, the card's back offers a story about Hank Aaron hitting his 600th home run. The Reggie Jackson signature on the 1971 Topps card is very different than what it would develop into on his later cards (see #3 and #4 on this list). Still signing as "Reginald," check out that huge "M" that stretches nearly half the card. Although he has many iconic baseball cards, the 1973 Topps card might be one of his most recognizable Reggie Jackson cards. However, with the grimace on his face and his famous mustache missing, casual fans might not realize the subject at first glance. Jackson's first card with the New York Yankees can be found in 1977 Topps and collectors have some variety as to which version they can collect. 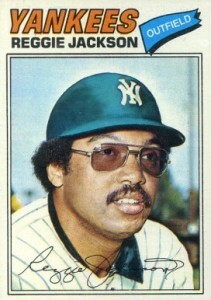 Topps issued a cloth sticker version of the 1977 Topps base card for 55 players, including Reggie, and Burger King also issued a Jackson card with a different photo using the same overall Topps design. 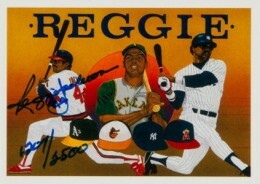 The topper of the nine-card Upper Deck Baseball Heroes insert set featuring Reggie in 1990 Upper Deck was this impressive autographed card. Although the signed card has a robust 2,500 copies signed, it is surprisingly rare and might inspire collectors to rip a box of one of the most produced card sets ever. Along with this base card in the 1970 Topps set, Reggie also has an All-Star card and two American League leader cards, including a home run leaders card he shares with Harmon Killebrew and Frank Howard. This second-year card is also a much more budget-friendly card than his rookie (and #1 on the list). 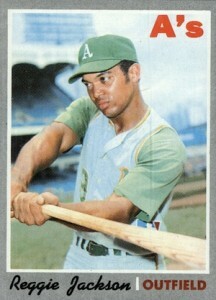 Although he started his MLB career while the A's were still playing in Kansas City in 1967, the first Topps card for Reggie Jackson came after the team's move to Oakland and has proven to be the key rookie in the 1969 Topps set. With the exception of highly-graded copies of Mickey Mantle's base card, it is also the most valuable card from the set. 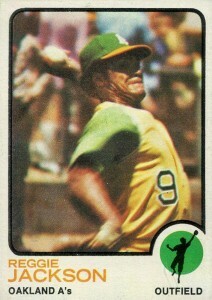 The A’s were in Oakland in 1969, as it clearly shows on the uniform. I have a holographic reggie jackson card and i was wondering if u could give me some insight. milk bottle tops from 1987 let me know value ?